Imperial authorities continuously reminded the German people that they were fighting a war against the rest of the world and used photographs of colonial prisoners as prime examples. 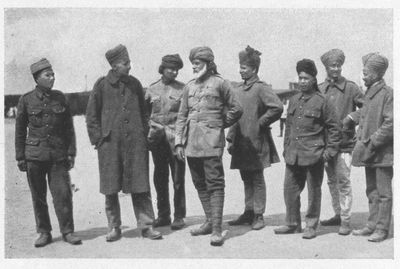 In this photo, Indian troops of the Indian Expeditionary Force stand outdoors at Muenster-Rennbahn. This propaganda campaign sought to encourage the Germans to fight harder to win the war and demonstrate the superiority of the empire's military forces.